“In 900 years of time and space, I’ve never met anyone who wasn’t important.” — The Doctor, Season 6, Christmas Special. This quote could also apply to the friendly customer service and welcoming atmosphere you’ll find at Blue Box Café in Downtown Elgin. 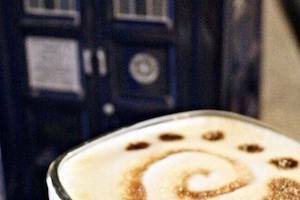 Owners Chris & Kathleen Mau opened their Doctor Who inspired cafe in early 2014. It’s been thriving ever since with a group of dedicated regulars and intrigued out-of-town visitors. Doctor Who art and photography adorn the walls and episodes play on the televisions. You might even find some Doctor Who inspired sugar cookies! What really sets Blue Box apart is their consistent offering of special events centered around Doctor Who and pop culture. They play the latest Doctor Who episodes so that folks can meet up with fellow fans to watch and enjoy themed drink and food items. Their “Live at the Blue Box” podcasts have a dedicated following who join in the fun for round table discussions, movie showings, trivia and cosplay. Podcast nights have featured themes including Harry Potter, Doctor Who, Game Show Night, 80s Night, Star Wars and many more. Other popular events include Board Game Night with Elgin Area Tabletop Group, James Wylder’s Tales by the Blue Light and SMG Micro-Con. It’s a geek’s dream come true! Blue Box Café makes everyone feel welcome with these fun events and a great menu featuring signature sandwiches, fresh salads, breakfast sandwiches, muffins, bars and cookies. Picky eaters will be pleased with their ‘Create Your Own Sandwich’ option. Choose a protein, bread and cheese topped with veggies and sauces all to your liking. Our try one of their signature sandwiches like the Elgin Blue, Blue Box BLT, Veggielicious or Submarine Italiano. Their seasonal “Gobbler” sandwich has developed a serious following with people dreaming of its arrival every fall. 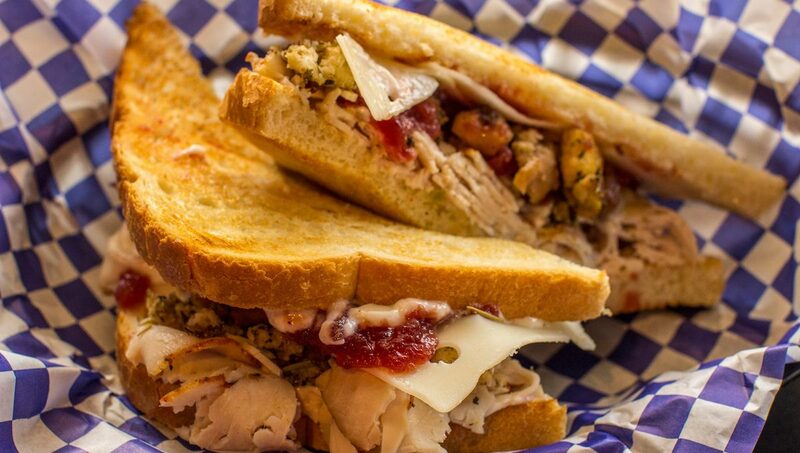 The Gobbler features oven roasted turkey topped with stuffing, sausage and cranberry dressing on sourdough with swiss cheese … it’s Thanksgiving between bread and is very addicting! The coffee brewed at Blue Box is a signature “Doctor” blend from Chicago-roasted Metropolis coffee. Their full espresso bar offers lattes, cappuccinos and mochas. They also offer Redline Espresso and other varieties for sale in 12 oz bags. Tea is from Rishi Tea of Milwaukee in flavors such as Earl Gray, Chai, Peach Blossom, Green Jade and more. On a rotating basis they offer coffee from Modest Coffee, Halfwit and Conscious Cup Roasters. Since opening Blue Box Cafe in 2014, Owners Chris & Kathleen have been active members of the Downtown community. Chris noted, “We really love the vibe and the potential of Downtown Elgin! There are so many exciting things that are, and will be happening, we feel lucky to be a part of it! 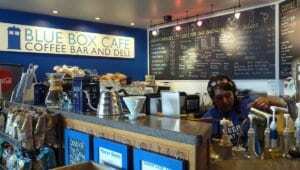 !” Whether you’re an official Whovian or you’re just looking for a great cup of coffee and a filling gourmet sandwich, Blue Box Cafe is sure to please!